Mid August heralds the turn of the season here in the south-east. Yellow-faced Honeyeaters are returning from Winter in the north, and Fan-tailed Cuckoos are adding their musical trill to the sounds of the forest. There has been a Red-bellied Black Snake sun bathing on the rocky clifftop each afternoon this week. The small skinks, too, have suddenly resurfaced from their Winter hideouts. We've rarely sighted a lizard all Winter, but today there were many small Grass Sun-skinks (Lampropholis guichenoti) out ... and hunting! Yesterday afternoon, as the barometric pressure dropped and the temperature warmed to the low twenties, the air was suddenly alive with clumsy, four-winged insects. There were thousands, and the swarming lasted a couple of hours. They don't fly well, or far, and the pond surface was quickly littered with struggling termites. We watched as individuals landed on fallen logs and tree stumps. Some would fly off again, but the majority would start walking over the surface, crawling into small cracks and holes. And as they squeeze in under the wood, they leave their wings behind! And then we observed a behaviour we've never noticed before ... pairs of termites prowling about in 'tandem'. The wandering termites, typically having already shed their wings, would pair up, nose to tail, and continue to explore the wood. Their investigations continued, in and out of nooks and crannies, until finally they would disappear from sight inside the log. Termites pair up after landing and the follower repeatedly touches the abdomen of the leader with its antennae and mouthparts. We thought this was likely to be pre-mating behaviour, and a little research this morning confirmed our suspicions. 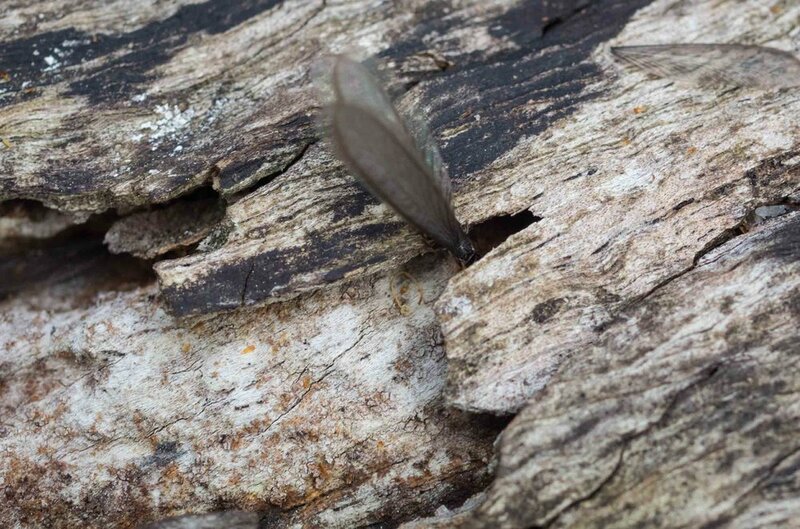 Termites disperse and establish new colonies through the release of young, winged individuals known as 'alates'. Large numbers of males and females are released, often synchronised by weather conditions. A female attracts a mate - presumably by releasing a pheromone from the tip of her abdomen - and the pair will then travel 'in tandem' until they select a suitable place to hide. The new Queen and her King then seal themselves into their chosen 'nuptial chamber' and begin reproduction. The colony can continue to grow over many years, with the same reigning couple. In fact, Queens and Kings may live for 20 years or more! Australia is home to more than 300 termites species, and only a few of these are recognised as destructive 'pests'. We have identified three species of termites here on the block, but it is likely there are more. For example, many species live in small colonies in high tree branches and so are rarely seen. Even those that live closer to the ground can be quite cryptic. Not all termites build mounds, and some species of subterranean termites build mounds only occasionally, or only in some parts of the species' range. 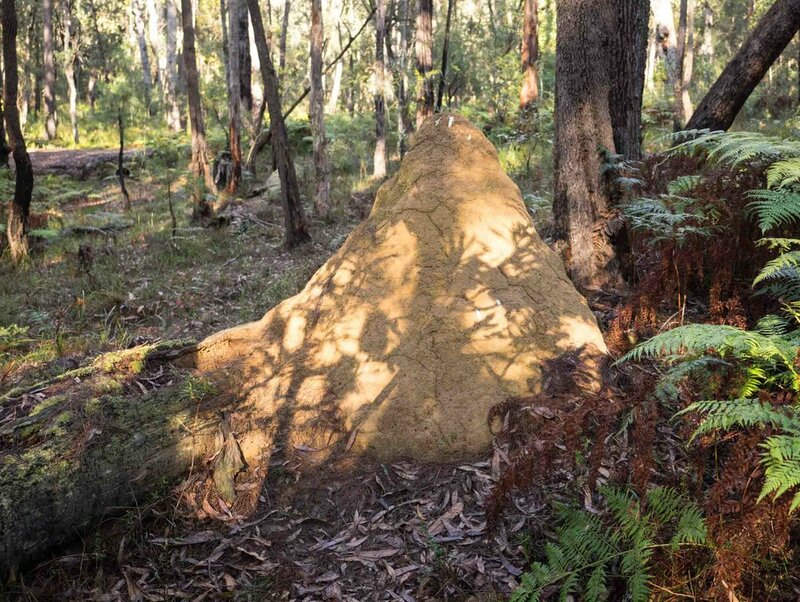 This is the only termite mound within our 5 hectare site. It is old - it hasn't obviously changed in size in the 14 years since we arrived. We are reasonably confident of the identity of the species that took flight yesterday. It is Coptotermes frenchi. A close look at the mandibles convinces us of the genus, and C. frenchi is known to be a common species throughout the south-east of Australia. Coptotermes are one of the feared groups of subterranean termites. They build colonies in the base of trees and then extend foraging tunnels for many metres through the soil to feed on suitable wood. They are excellent recyclers of fallen logs and sticks ... but you really don't want them in the house! Termite swarmings like yesterday's play an important role in the energetics of the forest ecosystem. While some termite pairs survive to found new dynasties, thousands of other would-be royals provide food for birds, reptiles and spiders. Their fat-rich bodies are quickly devoured at a time when there is little other insect prey available. This termite was particularly unlucky. There are very few spiders about at the moment - but that will change quite quickly from now on. With each passing day, the invertebrate world is coming 'alive' again! One of the unfortunate termites that crash-landed on the pond was quickly devoured by a diving beetle. This little lizard is scouting for one of its first meals of the season. I watched these Grass Sun-skinks (Lampropholis guichenoti) catching termites but failed to get a decent photo of the action ... it's all over very quickly! The timing of the first termite swarmings of the season is remarkably predictable; 14th August in 2017; 16th August in 2016; 22nd August in 2015. And this is just the first of a range of Great Events that mark Spring's return to the southern forests.